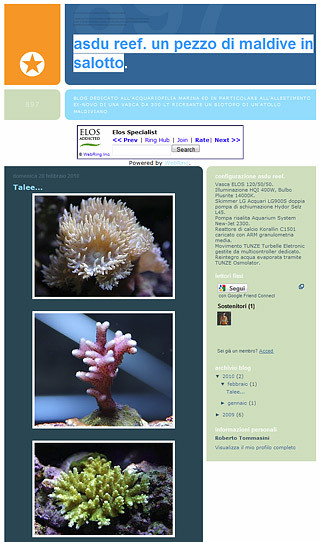 A new website it’s been added to Elos WebRing, it’s a site from Italy, called ReefNature and it’s dedicated to setting up the Elos SystemMidi but it’s developed in italian. Andrea begins from setting up his marine system and drives us in the construction of his system, day by day. The aquarium is a SystemMidi by Elos, and it’s the second after the french one of escenius. 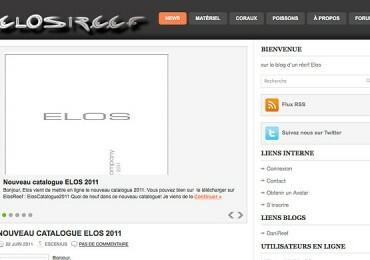 A new website it’s been added to Elos WebRing, it’s a very special site from France, called ElosReef and includes a blog dedicated to the Elos world, the escenius tank and a forum, it’s developed in French, but definitely worth a visit. 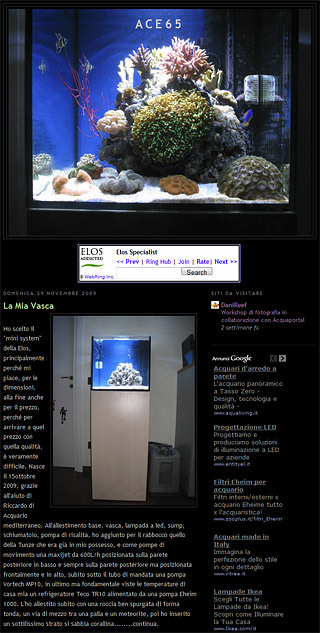 Escenius shows us his tank with beautiful photos and the aquarium is, of course, a Midi Elos, the first in the webring. Elos Webring: Rare Aquatic Plants… A road to the forest! 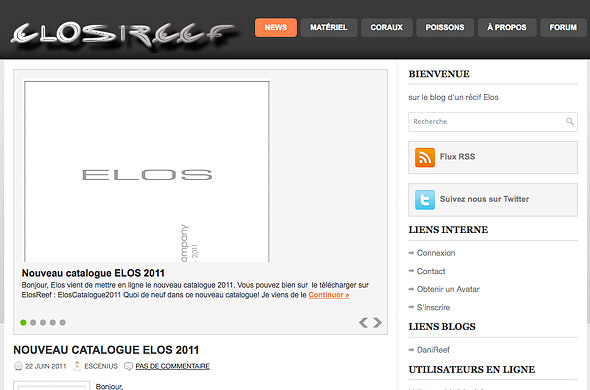 Finally after a bit ‘of time we have a new site in the webring Elos, and what a wonderful site! 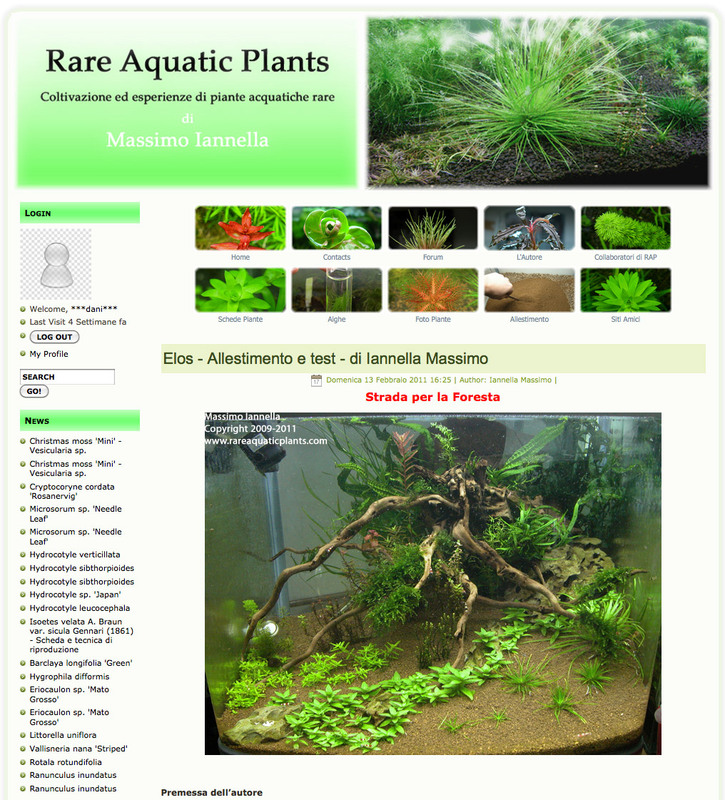 Rare Aquatic Plants is in fact a point of reference in the field of freshwater aquariums in Italy, and Max, the owner engages in the cultivation of rare and not always very easy to cultivate plants. A site all to see and enjoy. 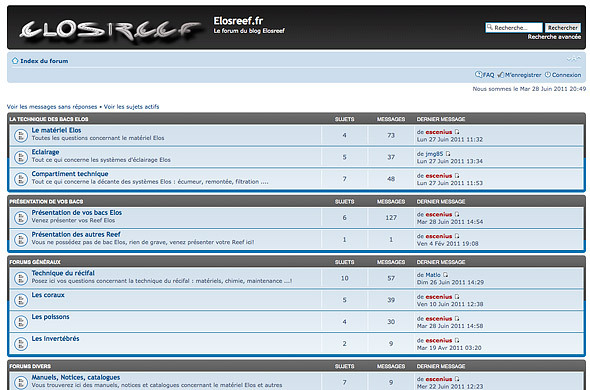 Max has tryed Elos products and then he decided to devote himself to their study by setting up a layout specifically designed for … He has called a road to the forest … take a look to his great and very long review, it’s required to register, but it is really worth. Sunday, June 13 was held the second Elos Open Day. 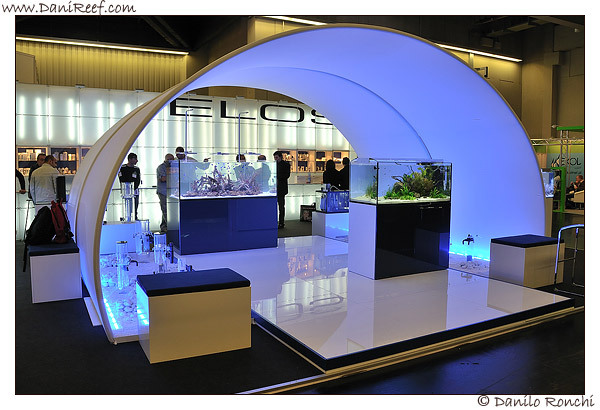 Also this year Elos wanted to give the chance for some aquarists to be his guests, first in a conference room where we talked about the latest news from the Nuremberg and LED lighting, then for lunch and then in factory to touch the novelties presented. Also this year I will begin my description of Interzoo 2010 at Nuremberg starting from Elos, as was done for the last Interzoo 2008, this is due to a long time past into the Italian stand, both for the many new features, as always Elos is usual to disclose them during this very important International Fair. This year’s Elos wanted to surprise us with a space stand, lit with many new solutions led, and that gave a characteristic blue light to the whole complex. Under the “passage” there were two beautiful tanks, one fresh water and one marina, as well as skimmers and calcium reactors as a corollary. Outside instead are placed two rows of tanks on the right the new fantastic Elos Midi, and to the left the SystemMini with a juicy news represented in the new Paludarium. All around the many novelties. The Elos webring grows again… now we have ASDU REEF where we can find the intriguing idea to build a Maldivian biotopus in the living room, thanks to Roberto. 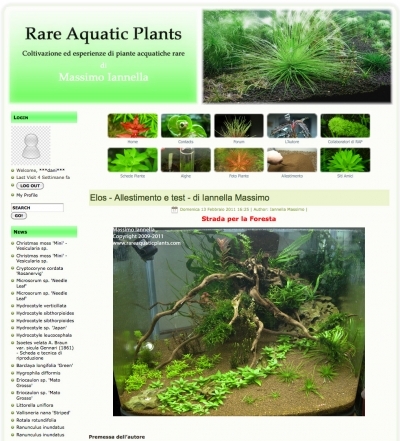 The site is developed only in italian language but filled with images. L’Elos webring ha aggiunto un nuovo sito incentrato sul System Mini. ACE65 ci parla nel suo blog omonimo ACE65 del suo System Mini mostrandoci con foto quanto sta ricreando e le piccole modifiche che ha apportato al sistema! The Elos webring grows again… now we have ACE65 with his System Mini between us. Into his website ACE65 writes about salt water, and she speaks about her tank, a beautiful system mini, with many tricks on his conduction. L’Elos webring ha aggiunto un nuovo sito alla lista. Ignazio ha creato OTIreefer dove parlerà del suo nuovo system mini Elos dal momento dell’allestimento fino alle foto dei coralli duri che vi ospita e devo dire che il risultato è di tutto rispetto con fotografie estremamente reali! The Elos webring grows again… now we have OTIreefer from italian Ignazio, finally we have a System Mini between us. Into his website Ignazio writes about salt water, and she speaks about her tank, a beautiful system mini, and with a tons of pictures of his sps. Il sito, totalmente in italiano, parla della vasca di Eleonora, una vasca 80x60x50h, in cui ultimamente sta provando il mangime per coralli della Elos, SVC-OMEGA-PROSKIMMER di cui discute i vari dosaggi e gli effetti sulla sua vasca. Da notare che Eleonora è anche una ottima fotografa e quindi le foto dei suoi coralli sono tutte da vedere! The Elos webring grows again… now we have Il Mondo Sommerso from italian Eleonora, finally a woman between us!. 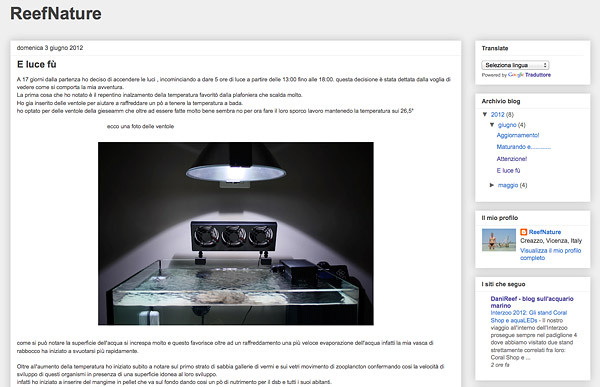 Into her website Eleonora writes about salt water, and she speaks about her tank, 80x60x50h cm, where she’s using the Elos Corals Food, Omega SVC and ProSkimmer with dosage and many advises. 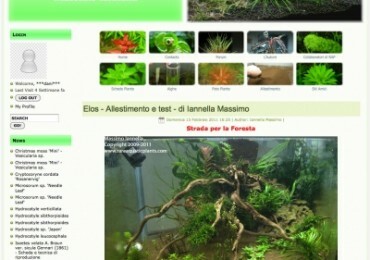 The site is developed only in italian language.